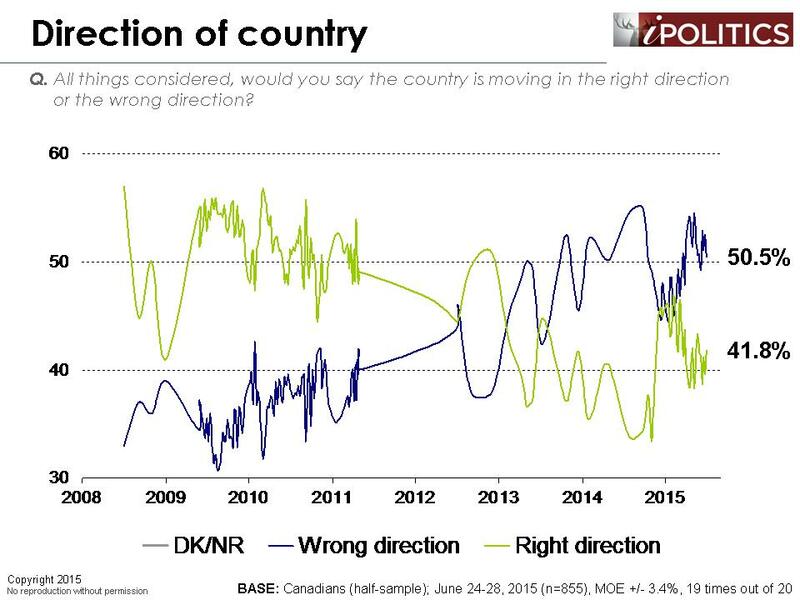 [Ottawa – July 3, 2015] The political landscape appears to be shifting in subtle but important ways. The Liberals seem to have stopped the bleeding and are now statistically tied with the floundering Conservatives who are over 12 points back from their majority achievement in 2011. The NDP continues to hold on to a narrow but significant lead which would be more decisive save for the entry of Gilles Duceppe into the Quebec race. An elevated ‘other’ reflects dissatisfaction with any of the above and perhaps those who would prefer a ‘more than one party’ answer. The NDP rise continues to be the most impressive feature of our recent time series data, but the declines of the Conservatives and the Liberals have also pretty clear over the past month. 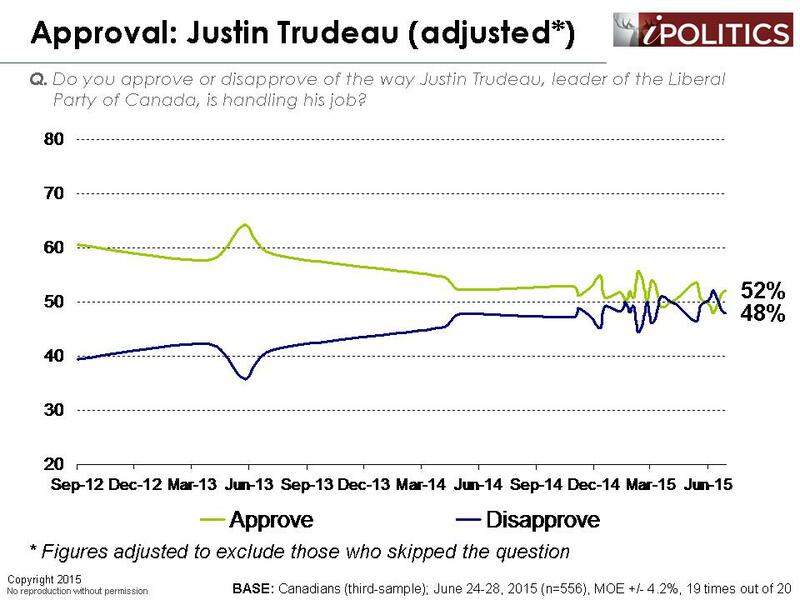 The Liberals, however, have shown a rebound whereas the Conservatives are once again headed downward. The NDP strength is distributed across the country but they would have good seat efficiency in Quebec and British Columbia. The tight three-way race in Ontario remains the critical unknown, but we can now certify the NDP rise there as more than an overnight sensation. The Liberals are looking competitive in Quebec, but the Bloc Québécois is the big question mark. Will their ascension continue? If not, that will favour the NDP as the default option. The Conservatives appear to be receding badly in Quebec as the terror and culture themes that revitalized them fade from public priority. 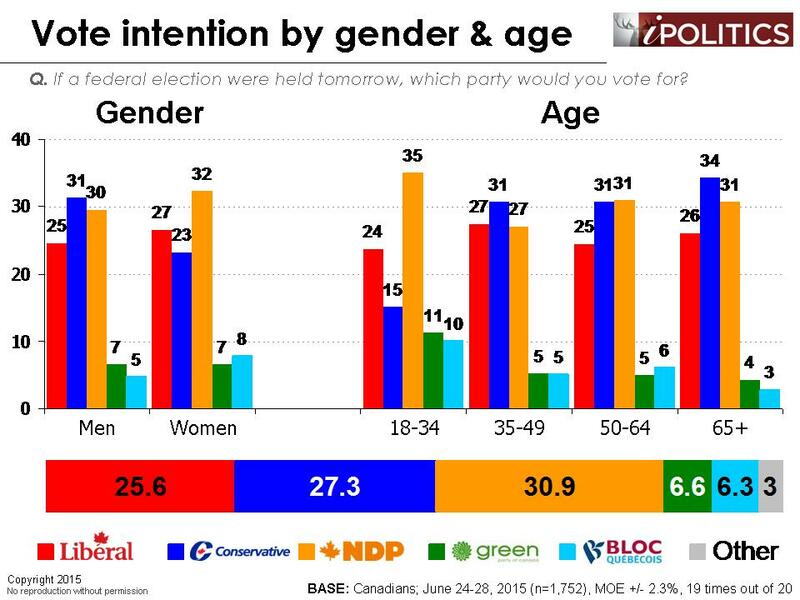 The NDP continues to do well across the demographic spectrum but their concentration with younger voters may be a concern in terms of turnout. The Liberal vote shows almost no significant differences across age or gender. 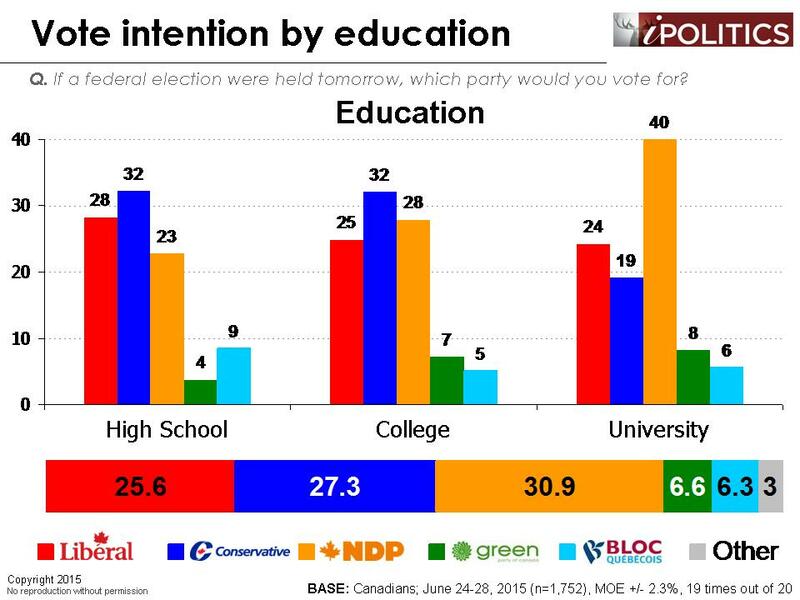 The NDP’s continued advantage with university educated voters remains a major and revealing asset. Finally, the fate of two smaller parties is also up in the air. The Green Party has fallen back and really needs something to get back in the fray. There is a big difference between ten points and eight points, particularly in pivotal ridings where they could aspire to be the best non-Conservative choice for progressive voters. The Bloc Québécois has definitely been invigorated by the return of Gilles Duceppe and this has been largely at the expense of the NDP. This dynamic will be important to watch in coming months. 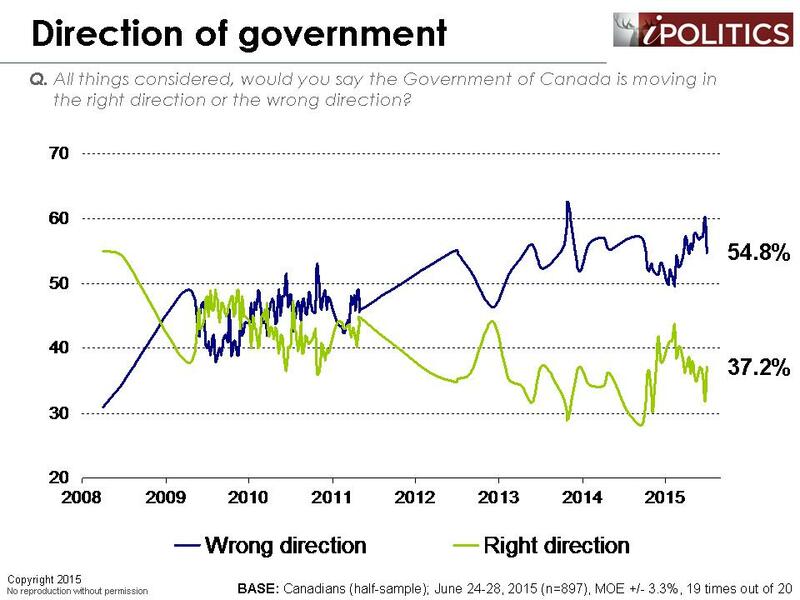 Turning to directional measures, we see a slight improvement in Canadians’ satisfaction with where their government is headed. There are a number of factors that could be driving this modest reversal, but the most likely explanation is that Canada Day, with its myriad of celebrations endless displays of red and white, has re-kindled Canadians’ appreciation for the country in which they live – at least for the time being. However, this is not the first time that we have seen a temporary Canada Day boost and the perceived direction of both the country and its government are still very poor by historical standards. Finally, we updated our tracking on which party holds the best and clearest plan. While no party holds a distinct advantage here, it is notable that the Liberal Party has succeeded in improving its standing by two to four points on all three indicators. While none of these improvements on their own is statistically significant, the fact that the party has improved its reputation across the board is highly noteworthy. Indeed, it appears that the Liberals have managed to raise the volume and clarity of their plans for Canadians and this previously muted connection was probably as or more important than any other factor in their fall from voter grace over the past few months. 1. 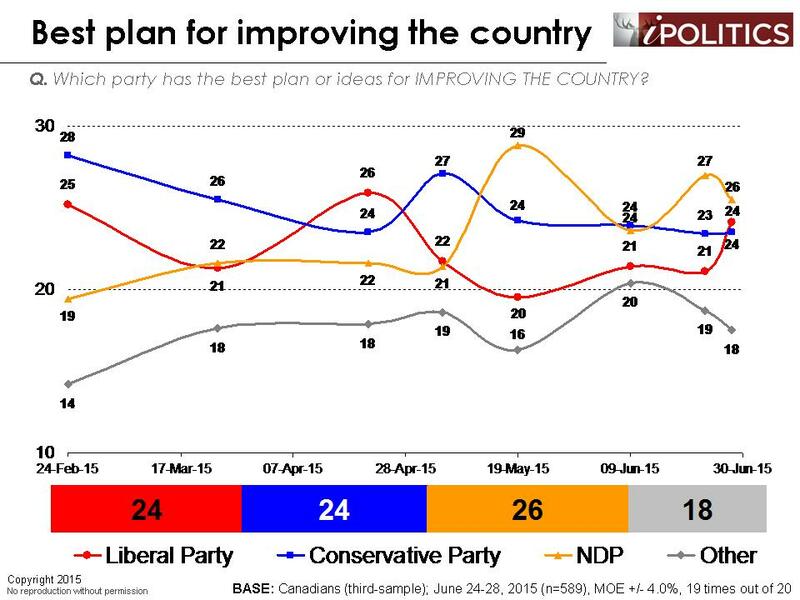 The NDP rise is real and, while it has plateaued, it leaves the NDP with a modest but clear advantage. This advantage is reinforced by their leader’s clear lead on approval, a good demographic and regional mix of likely voters, and a concentration of voters in some regions which will yield seat dividends. 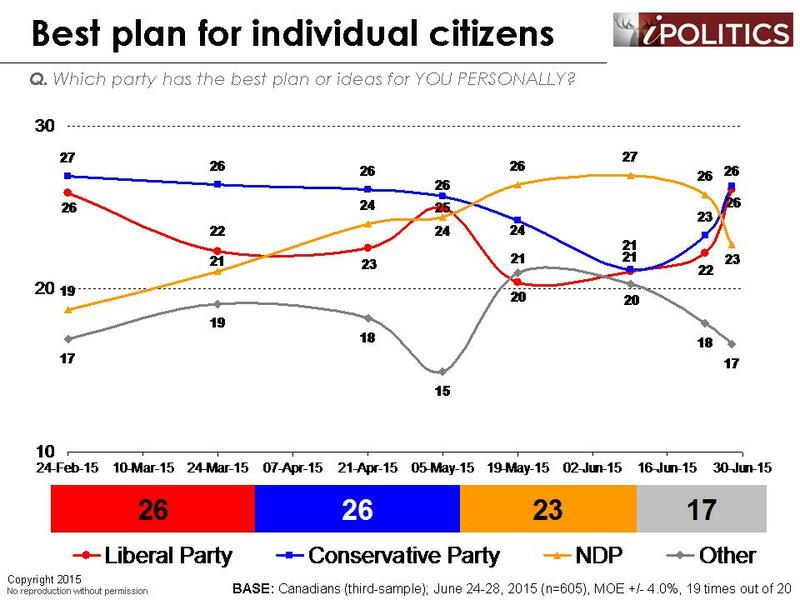 The Liberals appear to be in recovery and can legitimately aspire to close the modest gap they now suffer. Their leader scores well and more importantly, they are showing significant improvement on getting their messages about the future out. As with the NDP, the Liberals have ample head room in terms of second choice to aspire to form government. 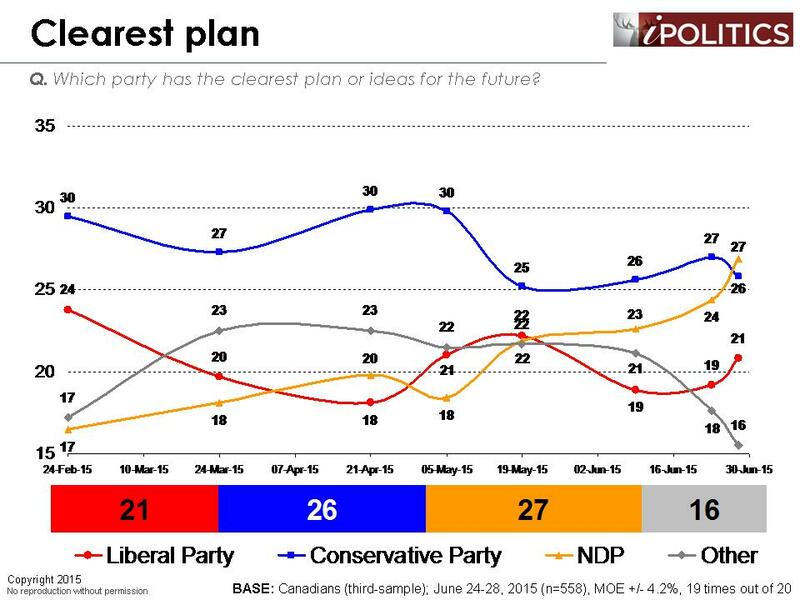 The Conservatives, while insignificantly ahead of the Liberals, are the party with the sternest challenges ahead. They have extremely scant second choice consideration and, as such, they have very meagre room to grow. Their leader has by far the lowest approval ratings, the economy is stalled, and they are mired at 27 points, more than 12 points short of their result in 2011 election. They have virtually no political capital left to spend if they encounter any further missteps. It is really hard to imagine what rabbits they have left to pull out of a pretty empty hat at this stage. 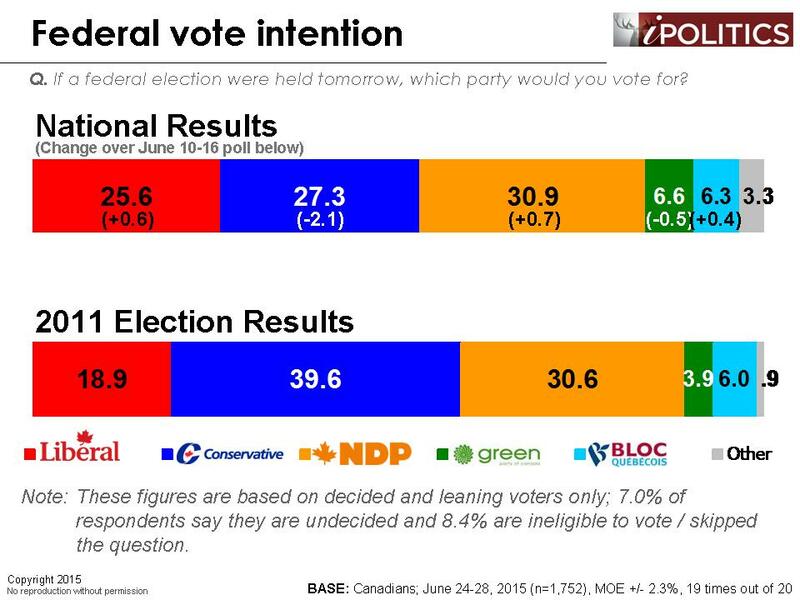 In closing, the directional, approval, and best plan numbers show the same patterns of a very tight race with a clear NDP lead, but the Conservatives and Liberals are basically tied for second and are not far back. The overall sense we have is that nothing is very clear in terms of next fall, but barring another security shock, it is increasingly hard to see a path to victory for the Conservative Party. The field dates for this survey are June 24-28, 2015. In total, a random sample of 1,752 Canadian adults aged 18 and over responded to the survey. The margin of error associated with the total sample is +/-2.3 percentage points, 19 times out of 20. The NDP is way too go so they can scrap Bill C-51 Bill C-24 and Bill C-377 They will be scraped by NDP GOVERNMENT. VOTE NDP!!! Don’t count the Conservatives out yet. Historical elections show that in Canada, a united conservative front is underestimated by an average of 2% in the polls leading up to the election. 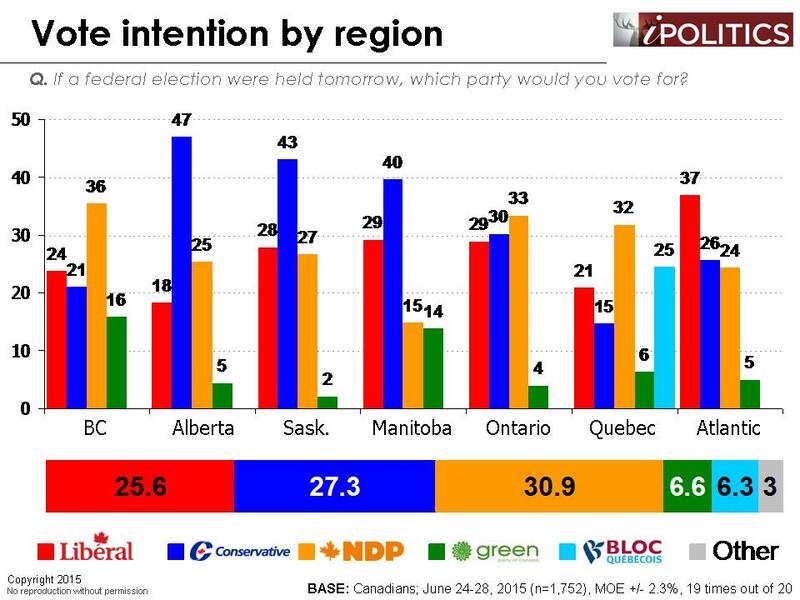 This, combined with the fact that few attack ads have been aimed at Mulcair thus far, indicates that there will be a tight 3 way race going into the election. Let’s see what the huge child cheques in July do to the polls. I am curious why you did not include the Greens in the party policy question or Elizabeth May in the leaders question. In my mind GPC has by far the most concrete and best policies and Elizabeth is the most articulate and well-informed in breadth and depth of any party leader. Some issues are more important than economic self interest. The environment for one. Trudeau has a plan. Mulclair is on a roll and Harper has Duffy and Wright and jailbirds to deal with. His steady hand is in recession. Over one hundred days to go. Has there ever been a longer wait time preceding a known election date? I can’t wait for the leaders debates to help the undecided voters make a choice and maybe shift some support around. I, and several others whom I know can corroborate the indicated preference amongst those of us who are university-educated to vote for the New Democrats. We like to research all available information before deciding. I believe the New Democrats have the best overall set of ideas (read the party constitution and policy book online), the best candidate for PM, and the will to hold themselves to the standards which Canadians now expect of their elected officials. I agree with Tom, Elizabeth should be included in the full set of data. Genesio, Elizabeth is hardly a “right winger”. Although she worked in the 80’s under Mulroney in an environmental role, Mulcair attempted to work under Harper in a similar fashion in 2007. I would consider both of them to be fairly centrist on balance. We need more MP’s from both parties in the house, so let’s not launch attacks against those doing the best job in our parliament. It’s silly and uncalled for. I find it laughable to read the above comments. Two people have referred to Mulcair and May as centrists. If they are centrists then who does that leave on the left??? Maybe tsipras in Greece and then the communists? We see how well that worked out for Greece and the USSR. As much as it may annoy the the socialists in this country, there is still about 39% of people in Canada that have common sense. 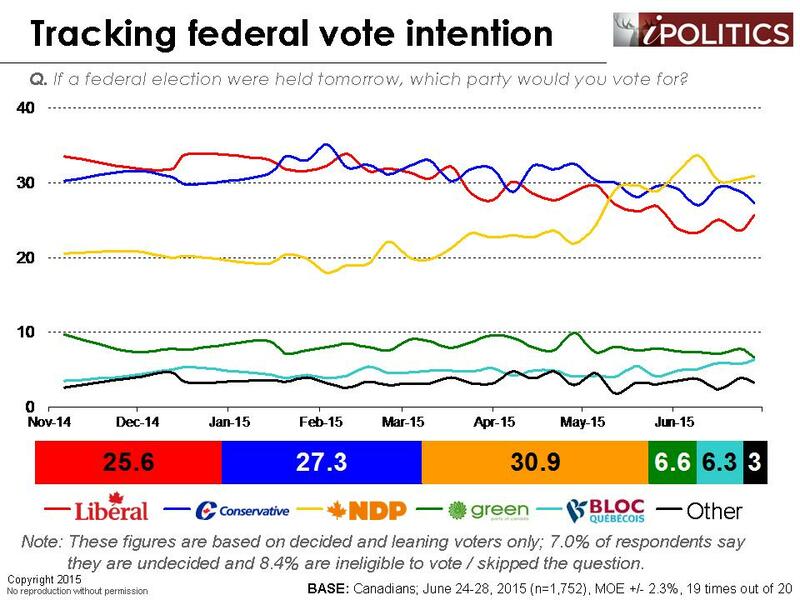 That 39% will make sure Harper is returned to government. And the Stat on how the university educated vote is very deceiving. They should separate out people with higher level training like doctors and engineers (who prefer conservatives) from those with social science degrees (who lean leftwards). Just a note that the “39%” you mention is the 2011 election result. Support for the Conservatives is down to about 27%, which represents about a 30% drop in support, or about 1 in 3 Conservative supporters who no longer feel that Harper is worth returning to government. 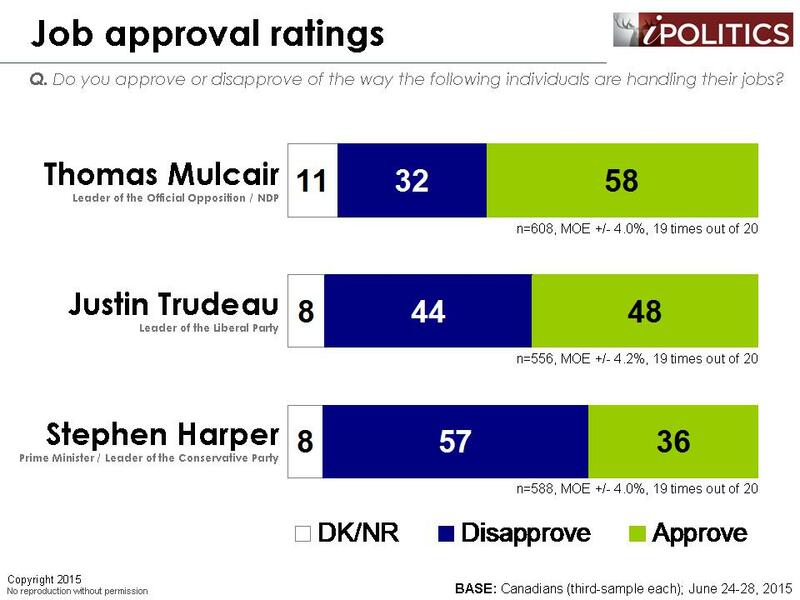 Trudeau, Mulcair, and May are all centrists compared to the unCanadian, anti-Canadian radical right wing Harper. Conservatives will be lucky to hold onto 3rd place with less than 25% of the vote, and Conservatives will be lucky to win a single seat east of Ontario. The problem with Greece is that the rich in Greece pay no taxes (Harper style) and middle class taxes are astronomical in order to make up for the Harper style tax cuts the rich in Greece get. No need to separate out people with higher level training like doctors and engineers from those with social science degrees. 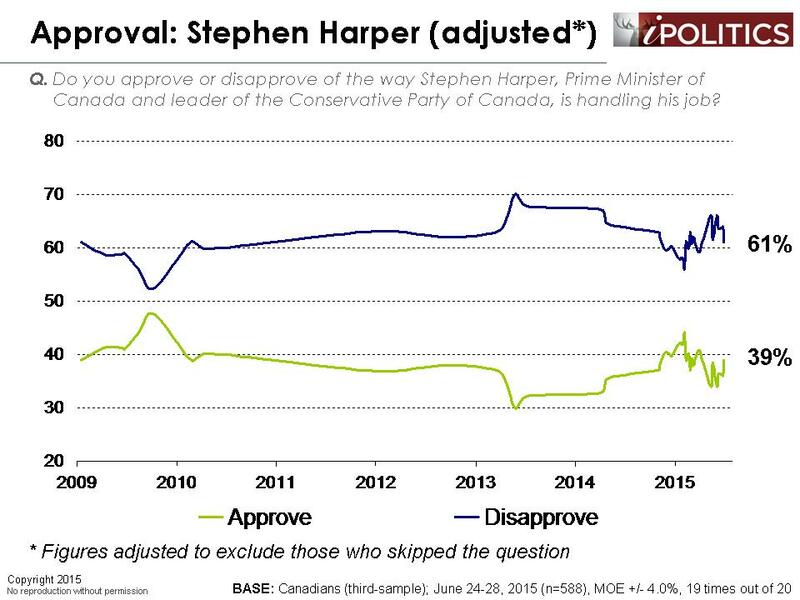 There is a universal move away from Harper and his economic policies leading Canada into recession. Stephen Harper, never was ready to be Prime Minister, still not ready to be Prime Minister, and a failure at his entry level job as Prime Minister. Stephen Harper. proven not ready. -He is gutting the CBC our national radio/tv. -He signed a trade pact with China that basically sold us out. -He worked with the KoCHK bros to spread disinformation regarding climate change. -H HAS DONE NOTHING AND CONTINUES TO DO NOTHING TO ADDRESS CLIMATE CHANGE. HE is endangering all canadians and future generations by doing NOTHING! -He is preventing th Election Commissioner from encouraging people to be engaged and go vote. -he refuses to debate with other party leaders. – he has not attended major climate summits in his own country. -We must stand up against Harper and Corporate greed. -He is getting ready to sign the TPP..biggest corporate coup in history. – He just gutted our charter of rights so he can push more oil pipelines and tar sands for his friends the KOCHK BROS from texas who own a huge chunk of the tar sands. Harper is BAD for CANADA is DICTATOR selling Canada to corporate interests and must be thrown out. Do you have a site where each riding has poll numbers. Im interested in Southwest Ontario especially. I was hoping for clear percentage numbers. Thanks for the map, Shaf. Oh how I’d love to see it turn accurate! Instead of each person cracking their head trying to figure the best way to cast their vote strategically, wouldn’t it be great if each voter could give an opinion on EACH candidate!? You could vote For (+1 vote), Against (-1 vote), or Abstain from voting (no change) for each candidate independently, thus convey your true opinion. That could be a first quick fix, with more improvements possible after, as you can read at the linked website. Click on my name to see the text I wrote to describe my ideas. If anyone bothered to check Mulcair’s past history as a Quebec Liberal they would not vote for him! 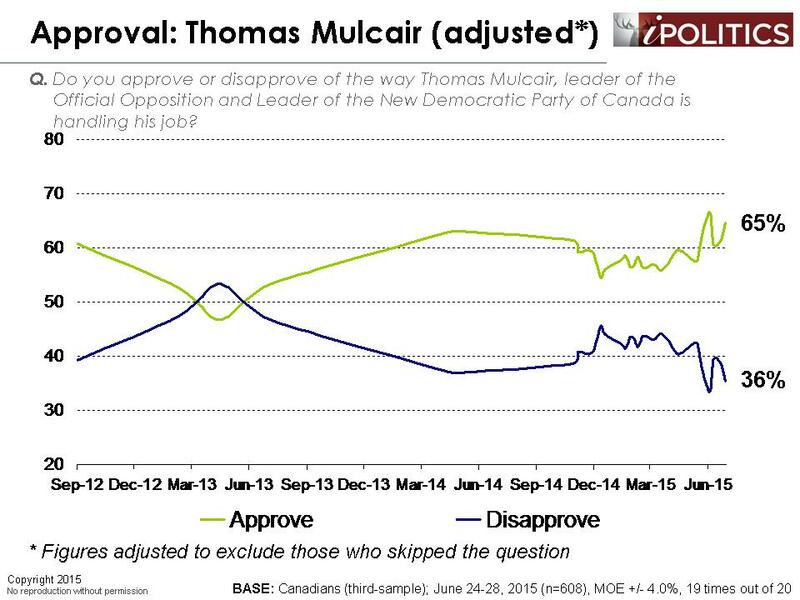 Even his colleagues were surprised that Mulcair didn’t go to run for the Conservatives rather then the NDP!! He’s an opportunist and his platform is pure fantasy!! $15 daycare, which is a provincial jurisdiction that even Mulcair has stated in an interview will likely be something different in each province with the provinces having to pay for 40% of it. $15 wage which applies ONLY to federal employees….the rest falls under provincial jurisdiction. Senate abolition will never happen….even with a referendum! C51 will have the dangerous parts repealed with the first court challenge and no doubt the rest will get amended!! We’ve had terrorism laws since 2001 and only 17 people have ever been charged under them! The fear mongering from both sides has gotten ridiculous! No one is spying on anyone that doesn’t need to be spyed on!! I base my vote on who has the best policies and the leftist NDP have nothing for me!! !